We tried to go to the movies on Saturday, to see Lincoln, but were unable to even find a parking space in the big garage next to the Century theater in Walnut Creek. Moving swiftly to Plan B, we went shopping in Sonoma and out to dinner at Lalimes in Berkeley. Trying again, we left early for the 3:45 showing this afternoon. Got lucky and found a parking space. Buying our tickets 30 minutes before the show, the clerk told us they were mostly sold out and we might not get to sit together. Once inside the theater, though, the upper section was full and the lower section was empty, so we grabbed 4 of the best and waited. And waited. At 3:45 the previews started, but it was almost 4:05 before the movie came on. Twenty minutes of previews, along with 3 separate notices to turn off your phone, is too damned much. Finally the movie started, with a huge battle scene that set a tone for the movie but really was incidental to the plot. 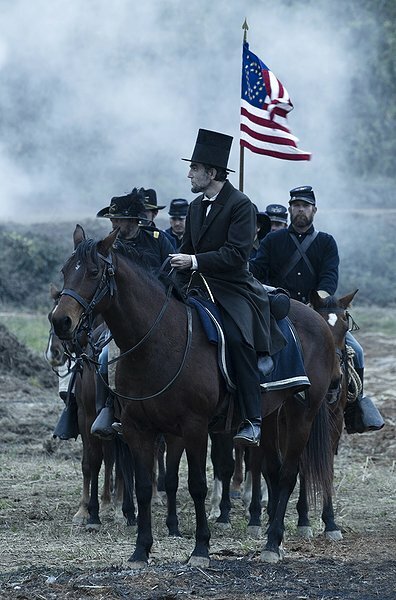 Lincoln is directed by Steven Spielberg, and there will be a couple of big, epic scenes no matter what. The story of Lincoln is about his brilliant politicking to get the 13th Amendment, abolishing slavery, through the House of Representatives. The Republicans, Lincoln’s party, will vote in favor while the Democrats are opposed. The Constitution calls for a 2/3 vote to pass an Amendment, and Lincoln must garner 20 votes from the Democrat side of the aisle. He uses flattery, persuasion and patronage bribery to accomplish his aims. The cast of this fine movie is exceptional. Daniel Day Lewis as Lincoln brings a warm and humanizing side to a man often depicted as cold and aloof, although his prosthetic makeup caused me to think of Cosmo Kramer much of the time. Tommy Lee Jones is cast as Thaddeus Stevens, leader of the Republicans in the House and chair of the Ways and Means Committee. In the modern day we are accustomed to public figures with both makeup and plastic surgery to keep them youthful and attractive; not so in 1865. Jones sports a worn and tired face that looks like 30 miles of bad road, and a preposterous mahogany-colored wig. Of course, you can look up a photo of the original Thaddeus Stevens and see the identical hairpiece. Mr. Spielberg wouldn’t have it any other way. Hal Holbrook, who I did not recognize at all, appears as Preston Blair, a behind-the-scenes powerhouse of the Republican Party (his home, Blair House, is the official residence of the Vice President). With his large head and silver mane, it was like he was channeling Teddy Kennedy for the role. There was more Kennedy reference–JFK’s sister, Ambassador Jean Kennedy Smith, has a small part as “shouting woman”. Two more excellent actors suppressed their egos for the part well enough for me to not recognize them. James Spader as W.N. Bilbo, a shady political operator who assists in getting Democrats to switch their vote to “Aye”, and Joseph Gordon-Levitt, portraying son Robert Lincoln. Sally Field turns in another fine performance as Mary Todd Lincoln. Nowhere near as mad as usually portrayed, Mrs. Lincoln was keenly attuned to the political game, and always accompanied by her maid, Elizabeth Keckley, a black woman who had managed to purchase her own freedom and wrote a book, Thirty Years a Slave, and Four Years in the White House. Spielberg has tried to make the film look like the paintings we see of the times–the lighting in particular is very painterly, not cinematic. The costumes are wonderful–Gail and I both noticed a coat worn by the Secretary of State Seward (the ever excellent David Strathairn), and Mary Lincoln’s dresses were wonderful. I have one possible historical quibble–and maybe someone who knows about this sort of thing will set me right. In the scene where Robert E. Lee surrenders at Appomattox, he is shown leaving the ceremony still wearing his sword. I should think that he would have had to “lay down his arms”, most certainly including his sword. Or maybe I just like to quibble. Knowledgeable commentary is appreciated. The screenplay is by Tony Kushner, the brilliant playwright of Angels in America. Starting with the text from Team of Rivals: The Political Genius of Abraham Lincoln, Kushner has turned the cold facts of history into the story of a doting father trying to raise his sons and lead his country in a time of great difficulty. The movie ends as you know it must, but then circles back to Lincoln’s second inaugural address and you leave the theater exhilarated, uplifted and pleased at the way you just spent 2 hours and 25 minutes. Plus 20 minutes of previews, but that’s Cinemark’s fault. Go see this movie. Get there late and avoid the commercials. Thanks Joel. This blog needs a fact checker.